IMPRESORA TERMICA EC LINE EC-3150D ETIQUETAS DE CODIGO DE BARRAS USBSERIALETHERNET, DE 2.8 MML HASTA 82MM. LA IMPRESOARA TERMICA DIRECTA DE EC LINE MODELO EC-3150D-USB, ESTA DISEÑANA PARA IMPRESION DE ETIQUETAS DE CODIGO DE BARRAS. TIENE LA VENTAJA QUE EC LINE HA MARCADO DE SER LA MAS ECONOMICA DEL MERCADO CON EL BENEFICIO POR UN MUY BUEN COSTO/BENEFICIO.. ADEMAS DE SOPORTAR LA ETIQUETAS PARA CODIGO DE BARRAS PUEDE SOPORTAR LOS DIFERENTES TAMANIOS DE PAPEL TERMICO PARA SACARLE PROVECHO TAMBIEN EN EL PUNTO DE VENTA. EC LINE SIGUE CRECIENDO SU LINEA DE PRODUCTOS AL AGREGAR A LA FAMILIA ESTA IMPRESORA. RECUERDA QUE EC LINE TIENE MINIPRINTERS, CAJONES DE DINERO, LECTORES Y MONITOR TOUCH SCREEN. COMPATIBLE PARA TRABAJAR CON SOFTWARE DE DISEÑO DE ETIQUETAS DE CODIGOS BARRAS DE TERCEROS. SI INCLUYE EL SOFTWARE PARA DISEÑO DE ETIQUETAS. 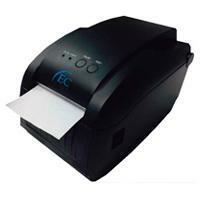 IMPRESORA TERMICA DIRECTA EC LINE EC-3150D-USB PARA ETIQUETAS DE COGIGO DE BARRAS E IMPRESION EN ROLLO DE PAPEL TERMICO. -METODO DE IMPRESION: TERMICO DIRECTO -SOPORTA IMPRESION DE CODIGOS DE BARRA EN 2D -VELOCIDAD DE IMPRESION: 152.4 MM/SEC -INTERFACE:USB -ANCHO DE PAPEL: 18MM - 82MM -RESOLUCION:: 203 DPI (8 DOTS/MM) -INTERFACE: USB + SERIAL + ETHERNET -FIABILIDAD DE IMPRESION: 100 KM -FUENTE DE PODER: 24V DC -SENSOR: MICROSWITCH -RJ-12 PARA CAJON DE DINERO: 12-24 V DC/ 1A -TEMPERATURA DE OPERACION: 0-45 °C -GROSOR DE PAPEL: 0.08 MM -MEMORIA: 2 MB -FONTS: GB2312, OPCIONAL LENGUAJE MULTIPLE -POSICIONAMIENTO AUTOMATICO DEL PAPEL DE ETIQUETAS -HUMEDAD: 10-80% (SIN CONDENSACION) -BARCODE: CODE128, EAN128,ITF, CODE39, EAN13,EAN13+2, EAN13+5, EAN8, EAN8+2, EAN8+5, CODABAR, POSTNET, UPCA+2, UPCA+5,CPOST, MSI, MSIC, PLESSEY, ITF14,ITF14, EAN14. -DRIVERS: WIN9X/WINME/WIN2000/WINNET/WINXP/VISTA -COMPATIBLE CON COMANDOS DE PROGRAMACION TSC -DIMENSIONES: 230X156X147 MM (LXWXH) -SOFTWARE DE DISEÑO DE ETIQUETAS: INCLUIDO. -SOPORTA BPM, PCX, ARCHIVOS BAS DESCARGADOS O ALMACENANDOS.